I might be completely wrong on this, but going off the numbers and I.D. 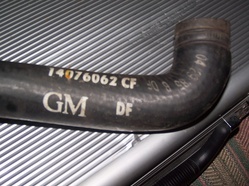 marks on this rad hose, I’m going with it’s the same one the car left the factory with way back in 1985. The only reason I took it off is that there’s a small gouge in it that I’m not taking a chance on. Other than that, the hose is fine and could probably go a few more years.